Chocolate Skincare is a skincare & beauty blog dedicated to the remarkable anti-aging benefits of chocolate for your skin. Turns out chocolate is not only delicious and tantalizing… it’s also a revitalizing marvel for your face and entire body. If you’ve ever dreamed of slathering chocolate all over your body, now you can – try a chocolate body lotion or chocolate body butter to start! Chocolate Reduces Fine Lines & Blemishes: Chocolate is heavy in polyphenols, which actively repair and regenerate the cells of the skin, directly combating the signs of aging such as fine lines and wrinkles. Chocolate Makes Your Skin Youthful & Glowing: These polyphenols, along with the omega-6 fatty acids that are abundant in chocolate, play another important role in skin health, as well. They enhance the flow of blood through the vessels of the body. Chocolate is a Wonderful Moisturizer: The omega-6 fatty acids in chocolate also give it incredible nourishing properties to keep the skin well-hydrated and moisturized. Chocolate Helps Lighten Hyperpigmentation Quickly: Because chocolate helps protect your skin from the the sun’s UV rays, it can prevent dark spots. And its antioxidants help lighten them quickly too – you can try a mask, moisturizer, or dark spot corrector for best results. 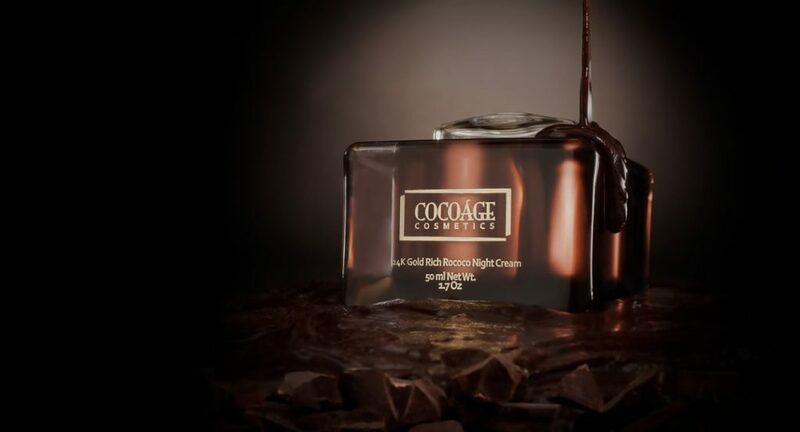 Cocoàge Cosmetics — the brains behind this Chocolate Skincare blog — is a chocolate & gold-based skincare line that will help you bring your skin back to its golden days naturally. Say goodbye to the surgeons and hello to a luxurious line of cosmetics fit for royalty. From everyday cleansers to toners and moisturizers, all the way to body scrubs and deep-treatment masks, all our products are crafted with Cacao Extract and pure 24K Gold for an experience like no other. The rich and luscious cosmetics formulas from Cocoàge beam a laser focus on skin imperfections to help you achieve the appearance you crave — and deserve. Every single one of our products was created by a team of cosmetic chemists and product developers with decades of experience in the beauty industry. The goal? For you to transform your skin while experiencing pleasure and luxury.